You are viewing part 3 of our Christmas Card Photo Shoot. If you remember, we left off at Little Man taking a commercial break during our photo session. Click here…if you didn’t have the opportunity to see this. Well, let’s just say after the BIG plane flew over us during the shoot…Little Man had other plans. 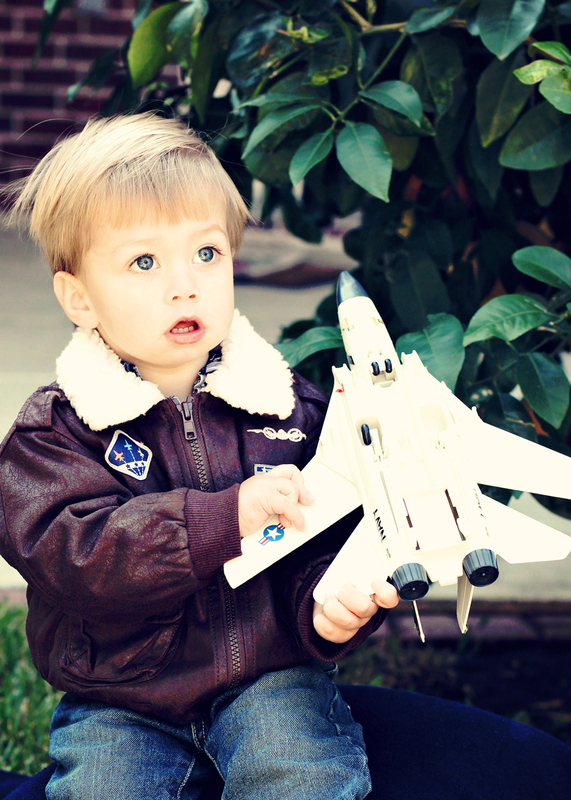 You see, he has his OWN plane and pilot bomber jacket and needed to show us…how it is done. Seriously, isn’t he just the cutest little pilot you have ever seen? These adorable items were bought by two of his GREAT grandparents! Yes, the Little Man has lots of grandparents and is very loved. Bonus inspiration for YOU: A Sense of Place…click here. Ironically, this story mentions Indianapolis, where my baby lives. Well, I guess she isn’t a baby anymore…smile, but parents will understand my meaning. This baby of MINE…will be in the next post, along with her so handsome husband. We had so much fun with this delightful couple at Thanksgiving and I can’t wait to share it with you. PS...I know I said, I would be taking a break….just forget about it☺ I have put everything on the back burner again, because I just had to show all these wonderful images throughout the holidays. Let me say before I go, what a JOY it is to read your comments and see you here. It literally makes my day. If you missed the Christmas Photo Shoot part 1…click here. Or part 2 click here. Such an adorable kid.Merry Christmas ! Who could resist that adorable face?! Enjoy your break and have a wonderful Christmas. Such an adorable young man. I was dying to see how it turned out…nice cliffhanger, Laurie…and it was worth the “Grand Finale.” Thanks! You’ve captured some precious moments. Seriously, he is one of the most beautiful children I have ever seen! He’s getting ahead start with everything is Little Man ! Laurie, He is adorable or should I say a handsome little lad. I just dream of taking pictures like this of my grandchild. Great job love. That which memories are made of. These are just beautiful, Laurie, and I so love the multitude of expressions. He is an ANGEL…incarnate or what, because wow. Just such a beautiful kid! Your pics just keep getting cuter and cuter! I do not know how that is possible but it is! I caught him with his dream! He looks like he’s ALL boy! A grandparent’s dream. Laurie, you are so funny! As soon as I read you were going to take a break, I put a note in my calendar to check on you and make sure all was well. Yet here you are and I love it! Thank you for putting other things on the back burner so we can enjoy your photos!! What beautiful photos! 🙂 He’s got this lovely, angelic expression on his face, between amusement and puzzlement. Ah, it reminds me of my two children when they were younger. Many thanks. Hey, Grandma you have to collect money for the Jet. Your little Man is ready to fly by himself. Have a nice Holiday! Your little man melts my heart.. He really is so cute. My little guy has asked for an airplane as well from Santa. Of course this Grandma has already bought it for him. Can’t wait to see him open it. Ohhh I seriously see a young pilot in the making. Tom cruise, eat your heart out, you have competition!! Little man is just cute beyond words! He’s such a little cutie! You got some great shots of him! He is such a cutie! Great photos – color, clarity – just beautiful! What a cutie! Beautiful photos – color, clarity – just beautiful! It’s those baby blues that get me! A lovely collection of photos and a fun story. Adorable 🙂 Congratulations on photos, Laurie! Love the look in the centre (first image/collage)! I am just waiting for the day to be standing in a checkout line, and looking at the magazine rack to see your picture of lil man on the front cover! Have a wonderful weekend! Oh he is really adorable, Laurie! He is a handsome dude that is for sure. And, that jacket is cute as can be. I love the lightening (if that is the correct word) in these photos. It looks so true but then again you are the expert and the rest of us remain in awe of your skills and your generosity in sharing tips. His eyes are huge and filled with wonder – love the photos! Looks like you’ve got a budding pilot there. Oh how cute is that!! It is so cute to watch with her ​​big blue eyes and knowing smile.All expressions passed over her face is lovely.You have a lot of luck and this little guy has more with all his family.This is a very loved kid. 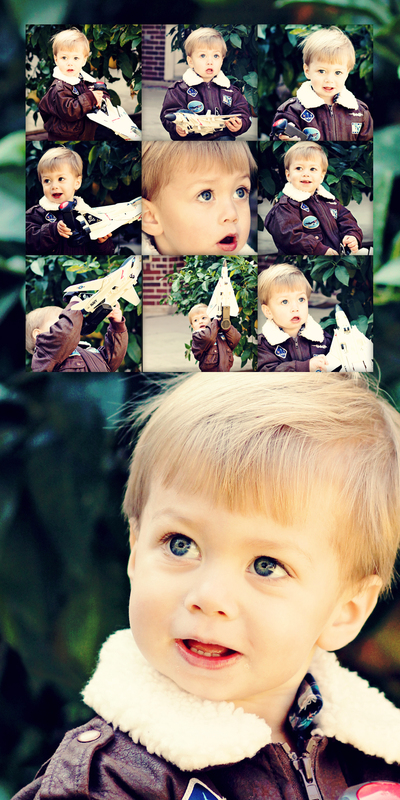 Just LOVE these pix of your Little Man in the bomber jacket! HE’S the bomb! That Little Man is priceless!!!! Would love to give him a great big HUG!! Give him one for me. Christmas should be a BLAST! !